Beets are filled with nutrients, and roasting them in their skins is the best way to preserve the vitamins and minerals they contain. One great thing about using the slow cooker for the beets is that it leaves the oven free for other uses. Plus, you can go about your day and run errands without worrying about something in the oven. It's a great "set and forget it" dish! Scrub the beets and rinse well. Trim the beets, leaving the rootlets intact and about one inch of the tops. Place a beet on a square of foil and drizzle with about 1/2 teaspoon of olive oil; rub the oil over the surface of the beet. Bring the corners of the foil up around the beet and twist to seal. Repeat with the remaining beets. Put the wrapped beets in the slow cooker. Cover, and cook on HIGH for 3 to 4 hours, or until the beets are tender. When they're cool enough to handle, remove the foil. Trim top and roots and slip the skins off. Use in a recipe or slice and eat! Slice or dice the roasted beets and use them as a side dish, or add them to a salad. Use red beets, golden or other varieties of beets in the recipe. There's the two-tone Chioggia beet, and you might even find white beets in some markets. 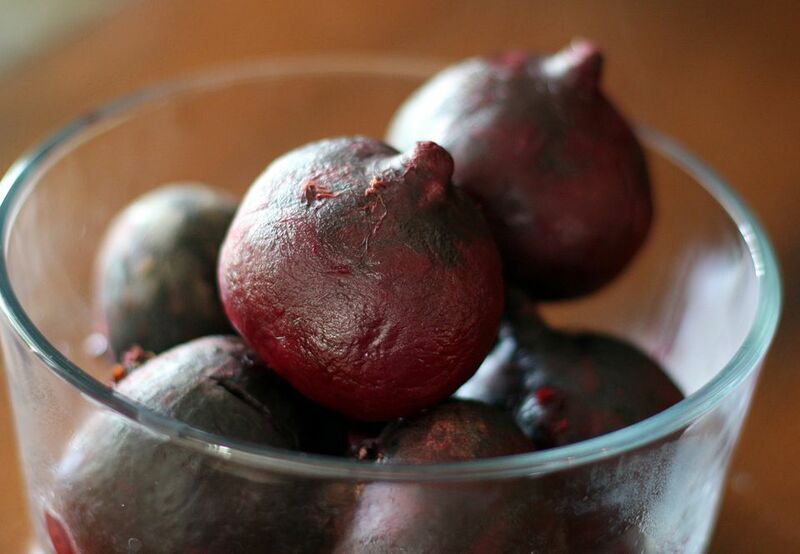 You can freeze the roasted beets for up to 8 months, and even longer if you use a vacuum sealer. This is especially convenient if you have an abundance from the garden or a local farmer's market. Roast the beets and remove the stems and skins. Slice the beets into rounds about 1/4-inch thick, dice them, or quarter them. If they are very small, leave them whole. Pack them into heavy-duty freezer bags or containers. Label with the name and date and freeze for up to 8 months. If you have a vacuum sealing system, they can be frozen for an even longer period of time because all of the air is vacuumed out. Freeze the beets in a single layer on a baking sheet and then vacuum seal the frozen beets in meal-size portions. Label, date, and freeze for 2 to 3 years. Check your vacuum sealer manual for more specific information.